Dublin Airport is the 10th busiest in Europe, facilitating 190 routes with 63 airlines. It averages 67,000 passengers per day and ‘handled’ 248 million customers since it opened in 1940. Dublin airport had experienced high levels of growth in passengers in recent years until the global economic crisis affected traffic in 2009 which is similar to the experience across European airports. As part of its development, the Dublin Airport Authority (DAA) commissioned a €1.2 billion Transforming Dublin Airport Investment Programme to create a vibrant, modern airport and an efficient portal for Ireland to the rest of the World. A new watermains infrastructure required pipelines to be installed across the main thoroughfare of the airport entrance. This is a 6-lane busy corridor that takes all traffic into and out of the airport. As such, maintaining traffic flow was a priority and open-trench was not an option. 2 No. crossings were required in parallel, each diameter being 225mm. There was a myriad of existing services along the bore. Experienced professional directional drilling contractors were required. 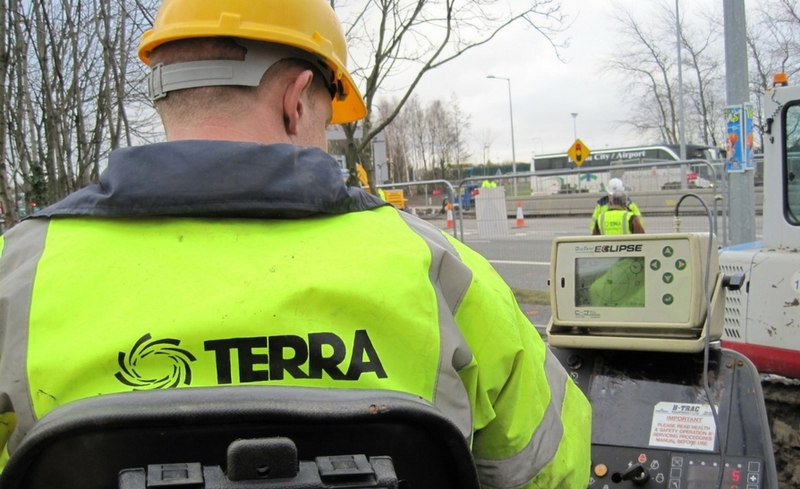 Directional drilling contractors Terra Solutions mobilised a Vermeer 36/50 directionally drill unit for the task. The servicers were carefully marked out and planned in advance of the drilling operation. Careful consideration was given to the path of the bore so as to safely avoid all services. A licensed suction tanker was mobilised to collect and dispose of excess bentonite and drilling fluids. The drilling unit completed the 2 No. 55 metre installs (including all pipe welding and fittings) within 5 days through adverse changeable ground conditions. The drilling was ‘tough’ but accurate and the reception pit was reached with perfect accuracy. See our other Directional Drilling projects here.